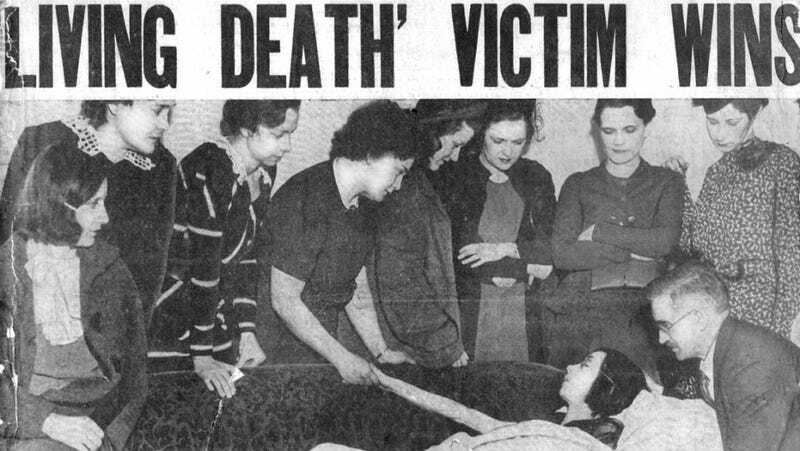 The famous radium girls took the reputation of radium from the savior of the sick to the killer of the poor. Working in a factory at a time when radium was considered the best way to improve health, by the time they died, they were exhaling radon gas and their hair glowed in the dark. When Marie Curie discovered radium, and word got out that it emitted a special type of energy, people began snapping it up. This was at at time when the entire world had begun craving more energy, whether it was electricity or gas. But radium started really making news when doctors noticed that exposure to radium was shrinking tumors. It was put in everything from cocktails to make-up, but its two main uses were health tonics and watch dials. Doctors prescribed radium-spiked health tonics to patients who felt under the weather. When World War I began, the faint illumination from radium paint allowed soldiers to see their watches, without the light from the watches making them targets. The watches continued to be big sellers after the war, which is why U.S. Radium Corporation took on a group of young women to paint the dials. The radium girls, confident that they were working with a perfectly wholesome element, sprinkled radium on their hair to make it glow, and painted their nails with it. Although this did expose them to radiation, they weren't poisoned by goofing around. To get the required accuracy with their paint-brushes, they were told to moisten and bring the brush to a point with their lips. Each time they did this, they swallowed a tiny bit of radium. Radium is what's called a "bone-seeker." It is chemically similar to calcium, and so when it is ingested, it goes right where calcium does — into the bones. This means, unlike some other elements, it stays in the body. As it stays in the body, it decays. As radium decays, it gives out two major forms of radiation, alpha particles and gamma waves. Alpha particles are bundles of two neutrons and two protons. They're not particularly dangerous if emitted externally. Inside the body, however, they shot the women's bones full of holes. Gamma radiation is dangerous no matter what. It killed off bone marrow, stopping the women's ability to produce red blood cells and turning them anemic and weak. As radium breaks down, it turns to radon, a gas. The victims had so much radium in their system that they exhaled the gas with every breath. Because the jaw has a relatively high turnover rate of cells, generally it got the largest amount of radium. The women saw teeth fall out of their heads, sores develop on their mouths, and felt their jaws literally splinter and crumble. Some had to have their jaws amputated. Then the rest of their bones began weakening and breaking. Their joints ached and they became more and more tired. They began dying, one by one, in their early 20s. In 1925, five women, all of them sick, sued U.S. Radium Corporation. One woman's hair glowed in the dark. They were all exhaling radon gas, and they knew they didn't have much time. The company brought all its forces to bear; its lawyers managed to stall for three years before they even got a court date. That proved to be a mistake. The lawyers for the women contacted Alexander Gettler, a famous toxicologist. They pointed to one of the first women to die, and asked if there were any way of finding out if this radiation they were talking about was still in her bones. The body was exhumed. The bones were scraped of tissue and cut down to samples. The samples were wrapped in black paper and put next to photographic film. Another sample of regular bones provided the control. After a few days, the control film was black. The film that had been next to the bones of the dead woman was covered with tiny bright marks. An unrelated setback spelled more trouble for the corporation. A millionaire, feeling tired, had been prescribed a tonic by his doctor. He wasn't aware that it had radium in it, but following his doctor's advice enthusiastically, he drank thousands of bottles over the course of a few years. By the time he died, he had wasted down to 90 pounds. The same photographic test, performed on his bones, left so many bright dots that they formed an exact outline of his vertebrae. It took time for the general public to catch up to the danger, but doctors and worker's rights organizations turned on the corporations with a vengeance. Wanting to cut their losses as much as possible, U. S. Radium Corporation settled, quietly, for a lump sum plus assurance that the company would cover the radium girls' medical bills. The women took it, knowing that, for the most part, they were getting money for funeral costs and a little extra for their families. None of them were under any delusion that they'd live through their 20s. Today, the dangers of radium, radon, and radiation are well-known, and the radium girls are seen as martyrs to both ignorance and corporate stone-walling.